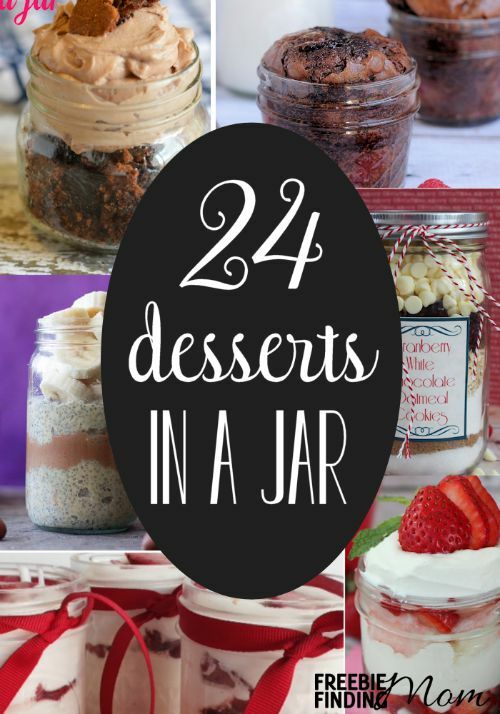 Desserts in a jar are some of my favorite treats. They’re cute, fairly uncommon (meaning they’re memorable), and just the right size to sooth a sweet tooth without overdoing it. 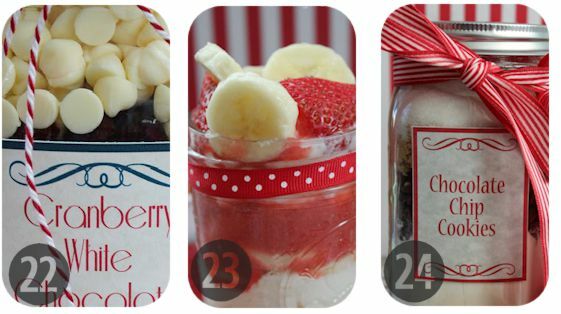 If you’re trying to be healthier and cut down on your sugar intake then desserts in a jar are a tasty compromise. 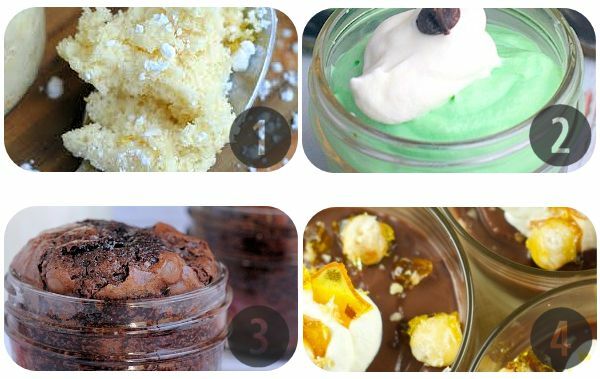 Furthermore, desserts in a jar are perfect for events where you have to travel such as the company picnic or a cookout at a friend’s house. They’re easy to transport, and you don’t have to worry about bringing plates or bowls to serve them on… people can just eat them straight out of the jar. 1. Lemon Cake (Freebie Finding Mom) – Whether you’re a sweet or savory palette, this dessert in a jar recipe is sure to please. 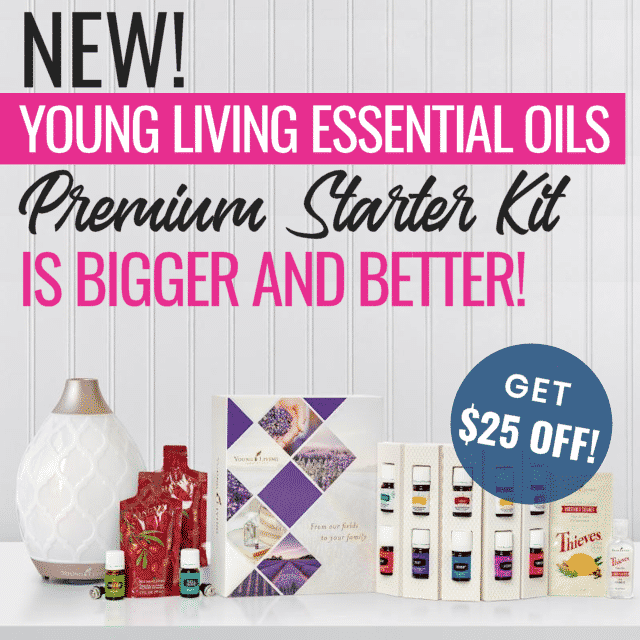 Plus, with just 3 steps, it’s as easy as 1, 2, and 3! 2. Mini Grasshoppers (Freebie Finding Mom) – One look at the ingredients in this recipe and you’ll start drooling Oreos, butter, marshmallows, whipping cream, and chocolate chips. Count me in! 3. Raspberry Brownies (Freebie Finding Mom) – Decadent chocolate melded with fresh raspberries? Yum! Plus, the raspberries in the brownies provide you health benefits like antioxidants and may help prevent certain types of cancers. 4. No Bake Hazelnut Cheesecake Parfaits with Candied Hazelnuts (Living Sweet Moments) – This delicious dessert in a jar requires no baking so you can enjoy it without heating up the house. 5. Cashew Chia Cacao Nib Pudding (A Calculated Whisk) – Looking for guilt free desserts in a jar? This is as close as it gets… this recipe for cashew chia cacao nib pudding is paleo friendly, gluten free, and can easily be made as a vegan friendly dish. 6. Espresso Panna Cotta (Sidewalk Shoes) – You may have never heard of panna cotta before but it’s about to be one of your favorite desserts! Panna cotta is an Italian dessert of cream thickened with gelatin and often flavored with coffee, vanilla, fruit, and other flavorings. 7. Snickers Cheesecake (Raining Hot Coupons) – Looking for a sinfully sweet dessert in a jar? Something that makes you pause after the first bite and fall back with a sigh of contentment? Look no further than this Snickers cheesecake recipe. 8. Strawberry Shortcake (Raining How Coupons) – Sweet and just a little bit tart, this recipe is light, fluffy, and perfect after a heavier meal. 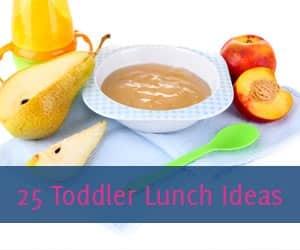 It’s also a sneaky way to get your little one to eat some fruit. 9. 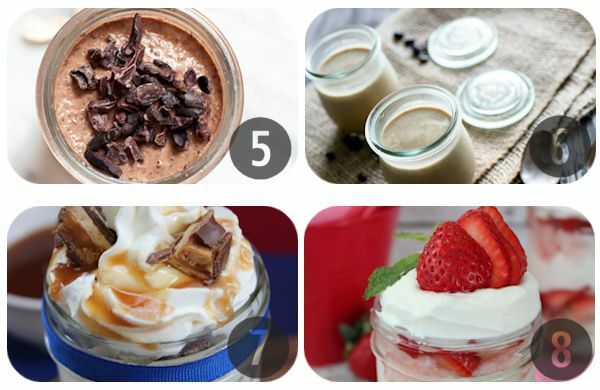 Peanut Butter Chia Pudding (Eat Thrive Glow) – This dessert in a jar could also be a “breakfast in a jar”. The chia seeds provide energy and omega 3 fatty acids, the peanut butter provides protein, and the bananas provide potassium (as well as a slew of other nutrients)… it’s a great way to start the day! 10. 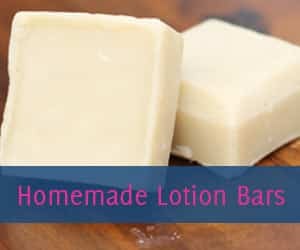 No Bake Cheesecakes (Ashlee Marie) – In the summer, I loath turning on the stove unless I absolutely have to, so I’m always on the lookout for no-bake desserts in a jar recipes. This one with Nilla wafer crust is amazing. 11. Brownies (Thrifty DIY Diva) – Indulge in a bit of chocolaty goodness with this recipe for brownies in a jar. Tip: Change the flavor up by using different flavors of whip cream so that this recipe never gets old. 12. Cupcakes (Thrity DIY Diva) – You’re just 4 ingredients away from heaven with this scrumptious dessert in a jar recipe for cupcakes. Tip: Customize this recipe with different flavors of icing to make it suitable for any audience. 13. Snickers Brownie Trifle Cups (The Farm Girl Gabs) – With Snickers bars, brownie mix, whipped topping, chocolate pudding, and caramel and chocolate topping, this dessert packs a powerful punch. Trust me, you’ll be tempted to lick the jar clean! 14. Grilled Peach Breakfast Parfait (Kitchen Sanctuary) – Here’s another example of desserts in a jar that can also play the role of a healthy and delicious breakfast. Loaded with crunchy homemade granola, creamy and nutritious Greek yogurt, and caramelized grilled peaches this dish is a true treat for your taste buds. 15. Chocolate Brownie Parfait with Salted Caramel (Kitchen Sanctuary) – Right around 3 o’clock each day I usually feel like I could use a break (or an outright vacation depending on my little one’s behavior)… this dessert in a jar is just the thing. I can utterly loose myself in the chocolate, oats, and salted caramel and all of the stress of the day simply melts away. 16. Mini Grasshopper Parfaits (A Calculated Whisk) – Similar to a fool (a dessert consisting of mashed fruit that has been folded into sweetened whipped cream), this recipe consists of refreshing mint blended with cream, chocolate chips, and nuts. 17. Slow Cooker Nutella Crunch Cheesecakes (Snappy Gourmet) – This dessert in a jar calls for one of my secret weapons: The slow cooker. The hardest part of making this recipe? Waiting long enough for the delicious mini cheesecakes to chill! 18. No Bake Strawberry Cheesecakes (Making Our Life Matter) – I love this recipe for the summer because of its light sweetness, but it is also great for Valentine’s Day because of the colors (white and red) and strawberries. 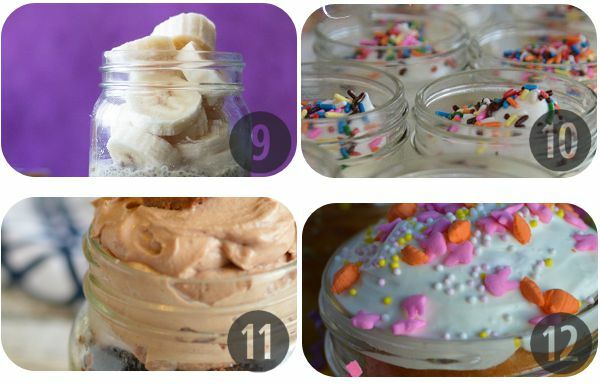 Desserts in a jar don’t always have to be “mini”. 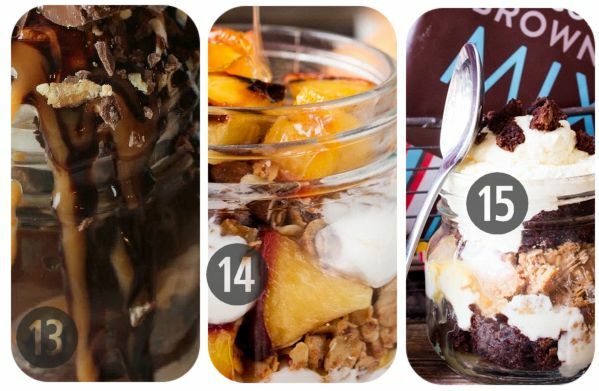 In fact, some awesome desserts in a jar recipes come in a full sized Mason jar. 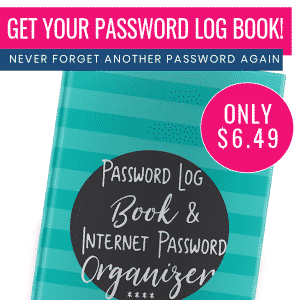 These make for great (and frugal) heartfelt gifts. Here are a few of my favorites. 19. Reese’s Pieces Cookie Mix (Freebie Finding Mom) – What better gift can you give someone than the gift of ooey gooey chocolate in the form of these irresistible cookies? Tip: Don’t open the Rese’s Pieces until right before you make this gift… otherwise you’ll eat them all! 20. 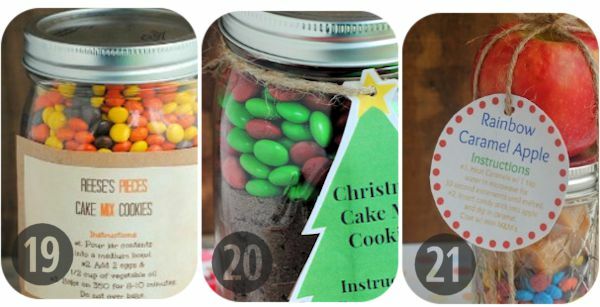 Chocolate Christmas Cookie Mix (Freebie Finding Mom) – This dessert in a jar recipe may say “Christmas cookies” but trust me, it’s awesome year round. Tip: Swap out the red and green M&Ms for a more appropriate color based on the holiday you’re celebrating. 21. Rainbow Caramel Apple (Freebie Finding Mom) – This gift is cute, unusual, and incredibly easy. I recommend turning to this dessert in a jar gift if you need a stocking stuffer or quick gift for a bunch of people (ex. your many nieces and nephews). 22. Cranberry White Chocolate Oatmeal Cookie Mix (Raining Hot Coupons) – These cookies offer a range of sensations and flavors for your taste buds… it’s like a road trip straight to tasty town (okay, that was a tad silly but seriously, these are pure deliciousness). 23. Strawberry Banana Cheesecake (Raining Hot Coupons) – Strawberries and bananas give this dessert in a jar a fresh fruitiness that your guests are sure to enjoy… and ask for every time they see you. 24. Chocolate Chip Cookie Mix (Raining Hot Coupons) – Chocolate chip cookies are the little black dress of cookies… and with good reason. This classic cookie simply never goes out of style! 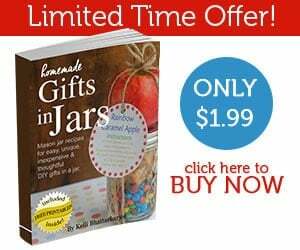 Be sure to follow Freebie Finding Mom’s Mason Jar Crafts & Gifts Pinterest board for even more inspiration. 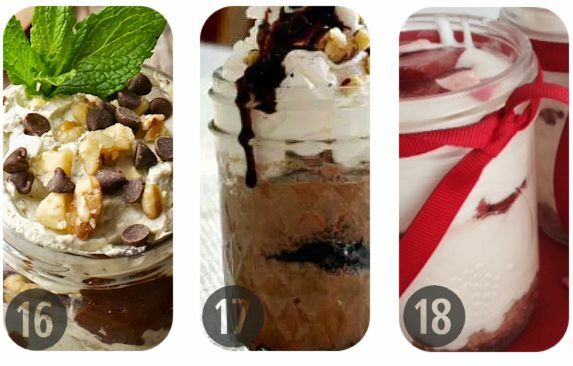 What are your favorite desserts in a jar recipes? Please share in the comments. Thanks, Sarah! Yep, I love little Mason jars to help with portion control. 1 cup is the perfect size.